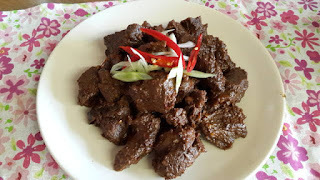 2 kg of lean beef, cut into medium size. Boil the meat with spices plus seasoning, do not add water. boiled until the meat is dry. On the other stoves heat the coconut milk, stirring until slightly dry. Mix meat and coconut milk, cook over low heat, wait until dry while stirring occasionally used the back of a wooden spoon. Try using non-stick pan so the meat is not destroyed even if cooked long.